Ultimately, the Elders on remote reservations are the primary concern when the economy threatens to impact critical food services. Elders such as Jennie and Rosella deeply appreciate the assistance. They each have their own story to tell. Jennie says there are only 2 country stores on the reservation for over 1500 people. Onions at this store can cost $1.29 per pound, compared to $0.48 per pound at Walmart. However, it is only once a month that the Elders are taken by bus to shop for food in town, and many of them don’t even go as they don’t have the money to shop. There is also one food mart that sells goods, which are outdated or in damaged cans. People do buy these products despite their condition because it is cheaper. Jennie appreciates that the arrival of the trucks means the Elder Nutrition Center will be able to serve good meals to the Elders, with food that is still good. In addition to enjoying the Elder meals herself, Jennie volunteers to help ensure that all the Elders receive good meals. Jennie helps deliver meal bags to the homebound Elders, sharing the benefits brought by the our trucks. She still walks 2 miles a day to keep herself fit and able to raise her 7-year-old granddaughter. Rosella says even though she still works, getting the free lunch at the center makes a difference. And the truck comes the second week of the month… when her food and funds really run the lowest. Rosella has heart trouble and diabetes and is very thankful for the nutritious, hot meals on a regular schedule. This helps her manage her diabetes. 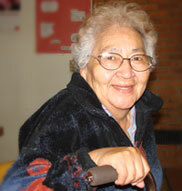 She feels the trucks coming shows caring, especially for Elders that are so often forgotten. Thank you for your support during these tough economic times. Our most vulnerable citizens, the Elders on remote reservations, appreciate all that you do.